VIII.4.4 Pompeii. Domus M. Holconi Rufi or House of Holconius Rufus. The room numbers are those referred to on the pompeiiinpictures pages for VIII.4.4. This plan is to help you accurately locate the rooms shown in the photographs of this large house. 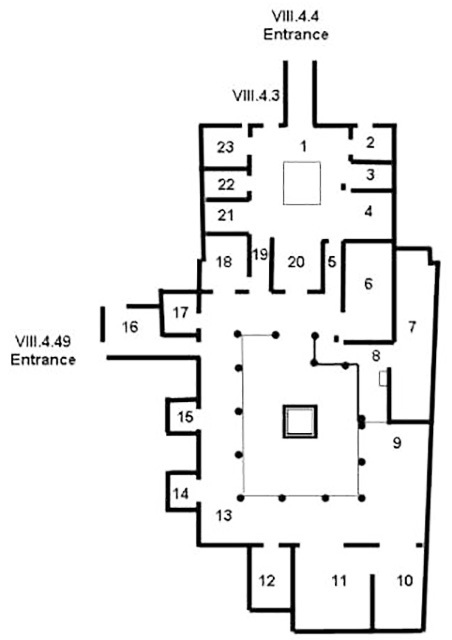 The plan also shows the link to VIII.4.3 and the entrance at VIII.4.49.